Objective: The objective of this study is to compare the apical sealability of mineral trioxide aggregate (MTA) Fillapex and Endosequence BC sealer at three different lengths of remaining gutta-percha after postspace preparation. Materials and Methods: A total of 80 freshly extracted human maxillary anterior teeth were decoronated, biomechanically prepared, and randomly divided into four groups; Group A and Group B served as positive and negative control with 10 teeth each. The teeth in Group C and Group D (with 30 teeth each) were obturated with gutta-percha using MTA Fillapex sealer and Endosequence BC sealer, respectively. Teeth in Group C and Group D were further subdivided into three subgroups depending on the length of remaining apical gutta-percha, i.e., 3, 4, and 5 mm after postspace preparation. Apical leakage was assessed using dye penetration method under stereomicroscope. Results: In both the Groups C and D, there was overall no statistically significant difference in leakage; however, Group C showed slightly more leakage than Group D. There was a statistically significant difference in leakage at 3 mm and 5 mm level in both groups. Conclusion: Although less microleakage occurred, the bioceramic sealers could not totally eliminate leakage. Gutta-percha along with a sealer has been used most commonly for obturation of the root canal. The role of the sealer remains critical as gutta-percha does not adhere to the dentinal walls and thus cannot prevent leakage by itself. Root canal failure can occur due to microleakage at sealer-dentin and sealer-core material interface. Bonding of the sealer to the root canal wall and formation of a monoblock can eliminate this drawback. A variety of endodontic sealers have been introduced in the market with varying properties to achieve adequate seal. Bioceramic-based sealers have attracted considerable attention due to their ability to bond to the tooth structure. EndoSequence BC Sealer (Brasseler, Savannah, GA, USA) is one such type of calcium phosphate silicate-based bioceramic cement which contains tricalcium silicate, dicalcium silicate, calcium phosphates, colloidal silica, and calcium hydroxide. It is a premixed, injectable, hydrophilic product that utilizes moisture within the dentinal tubules during the setting reaction and expands laterally resulting in superior marginal adaptation. Hydroxyapatite is coprecipitated within the calcium silicate hydrate phase to produce a composite-like structure, reinforcing the set cement, thus creating an ultimate bond between dentinal wall and sealer. Mineral trioxide aggregate (MTA) Fillapex (Angelus, Londrina/Parana/Brazil) is yet another type of bioceramic-sealer composed of MTA, resins, bismuth trioxide, nanoparticulated silica, and pigments. The presence of nanoparticles enables a homogeneous mixture and ensures better flow of the product. Manufacturer claims that MTA Fillapex provides long-term sealing capacity and promotes the deposition of hard tissue at the root apex. However, it may not be possible to maintain 5 mm of apical gutta-percha. Haddix et al. stated that in case of short root length to maintain adequate postlength, it might be necessary to extend postpreparations such that only 3 mm of apical gutta-percha is left. To the best of our knowledge, no study as such has evaluated the sealing ability of these two bioceramic-based sealers at different lengths of remaining apical gutta-percha after delayed postspace preparation. Thus, this study was undertaken to compare the sealing ability of two bioceramic-based sealers (Endosequence BC and MTA Fillapex) in postspace prepared teeth with different lengths of remaining apical gutta-percha (3 mm, 4 mm and 5 mm). Eighty straight rooted, human maxillary anterior teeth, extracted for periodontal reasons with mature apices were selected for the study. Teeth with preexisting carious lesions, cracks, fracture, endodontic treatment, resorption, or open apices were excluded from the study. All samples were decoronated using a diamond disc to a standardized root length of 12 mm. Working length was determined by inserting size #10 K file until it was just visible at the apical foramen and 1 mm was subtracted from it. The samples were stored in normal saline to prevent dehydration until use. Biomechanical preparation was done using #15–50 K-files (Mani) in a sequential order with copious irrigation using 5% sodium hypochlorite (NaOCl) (Safe Plus, Neelkanth, India) and 17% ethylenediaminetetraacetic acid (EDTA) (Dent Wash, Prime Dental Products private limited, India) after the use of every successive instrument. Step-back preparation was done till size 60 K-file. The canals were then dried with sterile absorbent paper points. Group B – (negative control; n = 10): The canals were left unfilled. The remaining 60 teeth were divided into two experimental groups (n = 30) depending on the sealer used. Group D:The teeth were obturated using gutta-percha and Endosequence BC sealer (Brasseler, Savannah, GA, USA). Radiographs were taken to evaluate the quality of root canal filling. The access cavities were sealed with Orafil-G (Prevest Denpro) and all samples were stored for 7 days at room temperature to allow the sealer to set. Subgroup C3 and D3: 5 mm of remaining apical gutta-percha. Samples in all groups except the negative control group were covered with two layers of nail varnish excluding the apical 2 mm. Negative control group were completely covered with two layers of nail varnish. After 1 h when the nail varnish had completely dried, all samples were immersed in 2% methylene blue solution (Ases Chemical Works, India) for 24 h at room temperature. The teeth were then washed under running tap water to remove excess dye on external root surface, and the nail varnish was scraped using a # 11 Scalpel blade (Bard-Parker, Surgivan). The teeth were then sectioned vertically along the long axis into two halves using a diamond disc, and the filling materials were removed from the canals using an explorer. Both the halves of each sample were screened under a stereomicroscope and the half that showed more dye penetration was selected. The selected half was further examined at ×20 for visible coronal extent of dye penetration (in millimeters) from the apical constriction. A graph was placed under each sample, and the numbers of grids were counted corresponding to the highest value of the dye penetration. The data were collected and subjected to statistical analysis. Statistical analysis was done using two-way ANOVA [Table 1] and multiple comparison using Bonferroni test [Table 2]. Stereomicroscopic examination revealed that all the positive controls demonstrated extreme amounts of apical leakage whereas all the negative controls demonstrated no detectable dye penetration [Figure 1]. Endosequence BC sealer showed comparatively less leakage at all the three levels of remaining apical gutta-percha than MTA Fillapex, although the results were statistically insignificant [Table 3], [Figure 2]a and [Figure 3]a. When leakage at different levels was compared, C1 and D1 group showed more leakage than C3 and D3 with a statistically significant difference [Table 2], [Figure 2]c and [Figure 3]c, whereas 4 mm apical gutta-percha (Group C2 and D2) did not show any difference when compared to 3 mm (C1 and D1) and 5 mm (C3 and D3) of gutta-percha. The main objective of obturation is to fill the entire root canal system and to produce an impervious apical seal. It is accomplished using a core and a sealer. Sealer fills the irregularities at the interface of the core material and the root canal walls, thus enhancing the apical sealability. Recent advances in the field of sealers have led to the development of bioceramic sealers. These sealers due to their alkaline pH, adhesion, chemical stability within the biological environment, and lack of shrinkage provide superior sealing properties in comparison to the traditional sealers., Thus, this study was aimed to evaluate the sealing ability of two bioceramic sealers, (i.e., Endosequence BC and MTA Fillapex) after postspace preparation. In the present study, maxillary anterior teeth with single canals were selected and decoronated to a length of 12 mm for standardization, precise length control, straight-line access, and easy canal preparation. Biomechanical preparation was done using the step back technique. The smear layer created was removed using 17% EDTA followed by 5% NaOCl as it might affect the penetration of the sealer into the dentinal tubules. Kuçi et al. evaluated the effect of the smear layer on the penetration ability of MTA Fillapex sealer and showed that smear layer removal was a critical factor for increasing the sealer penetration. Cold lateral compaction technique of obturation was used as heat could result in the reduced flow and setting time of the sealer. In addition, Zhou et al. suggested that the viscosities of bioceramic sealers are reduced, and flow is enhanced when shear stress is increased during compaction due to their pseudoplastic nature. The technique of postspace preparation could also have an effect on the apical seal. Studies have evaluated the effect of different techniques of gutta-percha removal; i.e., chemical, thermal and mechanical, on the apical sealing ability. Kwan and Harrington  showed that the influence of rotary instruments on the apical seal is minor since frictional heat causes softening of gutta-percha and slight apical pressure may act as vertical condensation, thereby improving the apical seal. Therefore, in the present study, the post space was prepared using Peeso reamers. The sealing ability of sealers could be evaluated employing various methods such as dye penetration, radioisotopes, bacteria and their products, such as endotoxins, fluid filtration, electrochemical, fluorometric assay, scanning electron microscopy, glucose penetration and dye extraction method. One of the commonly used methods is based on linear measurement of dye penetration. 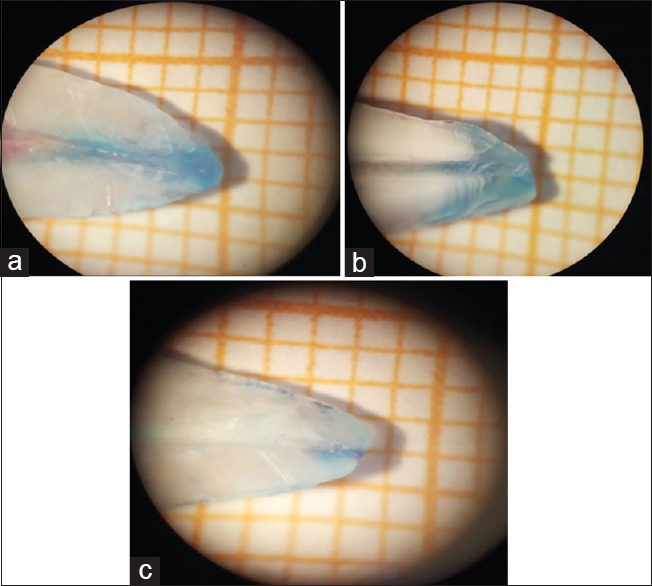 Methylene blue dye was used in the study as it has the potential to enter the obturated canals through the complex anatomies of apical third of the root canal or space between dentin-sealer-core material interfaces due to its molecular size which is similar to bacterial by-products. Matloff et al. compared methylene blue dye with radioisotopes of carbon, calcium chloride and iodine and found that dye penetrated farther than any of the isotopes, and also commented on its solubility in water and ease of use. Thus, 2% methylene blue dye was used in the present study as the leakage marker. Two longitudinal sections were produced. Stereomicroscopic examination was chosen for measuring the dye penetration as it gives a three dimensional view of the surface and needs no pretreatment of the specimen. Positive and negative controls were used in the study. The purpose of the positive control was to demonstrate the capability of the method to disclose voids present in the root canal filling because of the absence of a sealer while the negative control was kept to verify the ability of the nail varnish to prevent dye penetration through the lateral root surfaces and the canal. 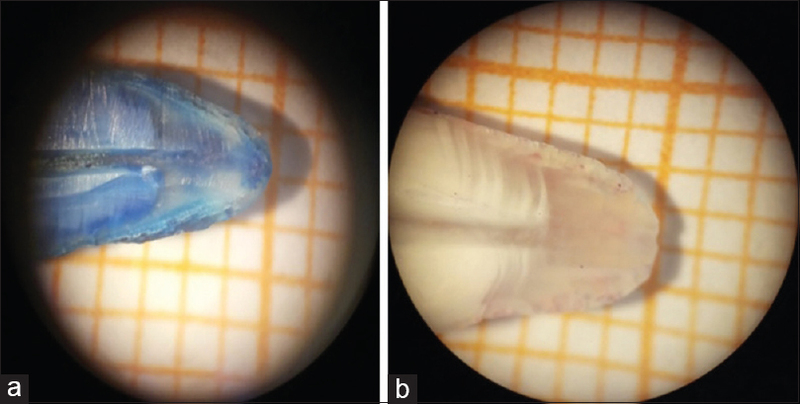 The results of the stereomicroscopic evaluation showed that the negative controls registered no detectable dye penetration whereas the positive controls demonstrated extreme amounts of apical leakage indicating that the dye penetration method was correctly executed. The overall lower mean values for leakage in both the groups can be attributed to the physical properties of the sealers such as better flow, less film thickness, and dimensional stability within the ISO specifications. This finding is in accordance with the study by Zhou et al. who found that MTA Fillapex and Endosequence BC sealers showed a better flow and less film thickness when compared to AH Plus, Gutta Flow and Thermaseal. In addition, the alkaline nature of the bioceramic by-products could have facilitated the penetration of sealers into the dentinal tubules by denaturing the dentinal collagen fibers. 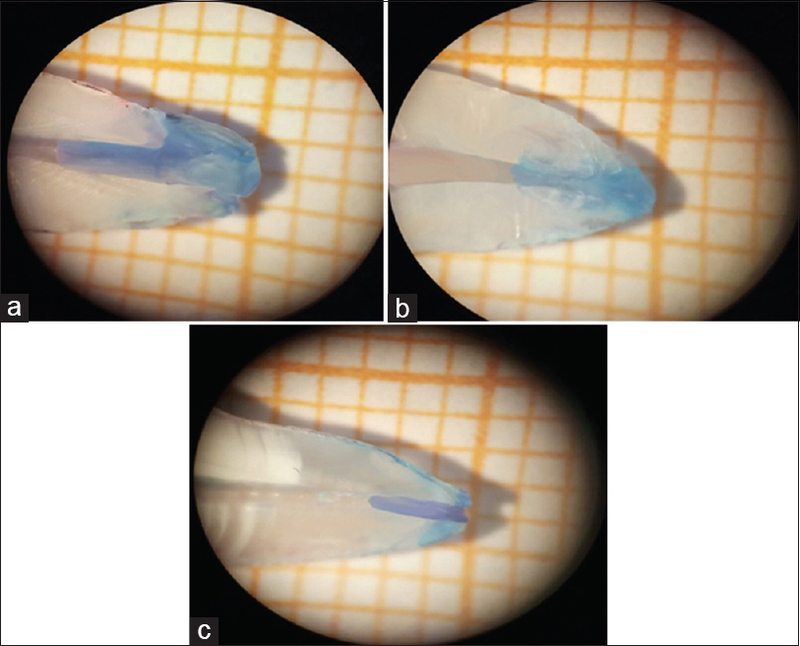 Stereomicroscopic evaluation of the samples in the present study showed a lower mean value of leakage for Endosequence BC sealer than MTA Fillapex sealer at all levels of remaining gutta-percha, although not statistically significant. The better apical sealability of Endosequence BC sealer in comparison to MTA Fillapex, could be attributed to the fact that Endosequence BC is a pure bioceramic sealer and expands on setting by about 0.2% (Deyan Kossev and Valeri Stefanov, 2009)., The expansion property of Endosequence BC is due to the formation of nanocalcium silicate (hydrophilic component) in the presence of moisture, which exhibits minimal or no shrinkage., Moreover, the low contact angle of Endosequence BC sealer allows it to spread easily over the canal walls, providing better adaptation and good hermetic seal. BC sealer also has the ability to form a chemical bond with the canal dentin walls by the formation of hydroxyapatite. The reason for the slightly higher microleakage of MTA Fillapex, which is a combined bioceramic resin-based sealer, could be because of low adhesion of the material that might be due to incomplete polymerization of its resin components leading to formation of poor microtags and shrinkage on setting., This finding is in accordance with the study done by Al-Haddad et al. Irrespective of the sealer used, among the three different lengths, higher mean microleakage was recorded for 3 mm followed by 4 and 5 mm of apical gutta-percha. When 3 mm group was compared to 5 mm group, there was a statistically significant difference in the microleakage values. However, between 3 and 4 mm group, there was no statistical significant difference. The results of the present study are in accordance with other studies of Mattison et al. and Nixon et al. who showed a direct correlation between the length of remaining apical root canal filling and the efficacy of its seal. The higher leakage at the 3 mm level could be accounted to the lower density and diameter of the dentinal tubules found at the apical level, which could have resulted in lower sealer penetration. Therefore, it can be concluded that Endosequence BC sealer and MTA Fillapex show promising results in maintaining the apical seal after postspace preparation at 4 and 5 mm of remaining apical gutta-percha. However, it still holds true that at 3 mm remaining gutta-percha level, the effect of root canal morphology in causing leakage cannot be overcome even with the use of bioceramic sealers used in this study. In addition, further studies are needed to establish the sealing ability of these sealers using different obturation techniques, timing of postspace preparation, and postspace preparation methods in clinical situations. Padmanabhan P, Das J, Kumari RV, Pradeep PR, Kumar A, Agarwal S, et al. Comparative evaluation of apical microleakage in immediate and delayed postspace preparation using four different root canal sealers: An in vitro study. J Conserv Dent 2017;20:86-90. Chen G, Chang C. The effect of immediate and delayed post-space preparation using extended working time root canal sealers on apical leakage. J Dent Sci 2013;8:31-6. Pawar SS, Pujar MA, Makandar SD. Evaluation of the apical sealing ability of bioceramic sealer, AH plus & epiphany: An in vitro study. J Conserv Dent 2014;17:579-82. Tyagi S, Mishra P, Tyagi P. Evolution of root canal sealers: An insight story. Eur J Gen Dent 2013;2:199-218. Zhou HM, Shen Y, Zheng W, Li L, Zheng YF, Haapasalo M, et al. Physical properties of 5 root canal sealers. J Endod 2013;39:1281-6. Demiriz L, Koçak MM, Koçak S, Sağlam BC, Türker SA. Evaluation of the dentinal wall adaptation ability of MTA fillapex using stereo electron microscope. J Conserv Dent 2016;19:220-4. Abramovitz L, Lev R, Fuss Z, Metzger Z. The unpredictability of seal after post space preparation: A fluid transport study. J Endod 2001;27:292-5. Haddix JE, Mattison GD, Shulman CA, Pink FE. Post preparation techniques and their effect on the apical seal. J Prosthet Dent 1990;64:515-9. Rita C, Kalyan S, Kala M, Biji B. Comparison of apical sealability of AH plus and GuttaFlow sealers at three different levels of remaining gutta-percha in teeth prepared to receive posts: An in vitro study. Endodontology 2014;26:270-8. Kuçi A, Alaçam T, Yavaş O, Ergul-Ulger Z, Kayaoglu G. Sealer penetration into dentinal tubules in the presence or absence of smear layer: A confocal laser scanning microscopic study. J Endod 2014;40:1627-31. Viapiana R, Moinzadeh AT, Camilleri L, Wesselink PR, Tanomaru Filho M, Camilleri J, et al. Porosity and sealing ability of root fillings with gutta-percha and BioRoot RCS or AH plus sealers. Evaluation by three ex vivo methods. Int Endod J 2016;49:774-82. Kwan EH, Harrington GW. The effect of immediate post preparation on apical seal. J Endod 1981;7:325-9. Al-Sabawi NA, Ismail SA, Al-Askary RA. Effect of different techniques of immediate and delayed post space preparation on apical seal. Al Rafidain Dent J 2012;12:249-56. Aydemir H, Ceylan G, Tasdemir T, Kalyoncuoglu E, Isildak I. Effect of immediate and delayed post space preparation on the apical seal of root canals obturated with different sealers and techniques. J Appl Oral Sci 2009;17:605-10. Mokhtari H, Shahi S, Janani M, Reyhani MF, Mokhtari Zonouzi HR, Rahimi S, et al. Evaluation of apical leakage in root canals obturated with three different sealers in presence or absence of smear layer. Iran Endod J 2015;10:131-4. Matloff IR, Jensen JR, Singer L, Tabibi A. A comparison of methods used in root canal sealability studies. Oral Surg Oral Med Oral Pathol 1982;53:203-8. Polineni S, Bolla N, Mandava P, Vemuri S, Mallela M, Gandham VM, et al. Marginal adaptation of newer root canal sealers to dentin: A SEM study. J Conserv Dent 2016;19:360-3. Kossev D, Stefanov V. Ceramics-based sealers as new alternative to currently used endodontic sealers. Res Ceram Based Sealers 2009;1:42-8. Al-Haddad AY, Kutty MG, Kasim NHA, Aziz Zaca. The effect of moisture conditions on the constitution of two bioceramic-based root canal sealers. JDS 2017;12:340-6. Mattison GD, Delivanis PD, Thacker RW Jr., Hassell KJ. Effect of post preparation on the apical seal. J Prosthet Dent 1984;51:785-9. Nixon C, Vertucci FJ, Swindle R. The effect of post space preparation on the apical seal of root canal obturated teeth. Todays FDA 1991;3:1C, 6C.